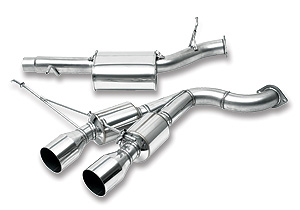 Finally, an all-stainless catalyst-back exhaust system that rivals the best that Europe has to offer! Neuspeed's latest generation of exhausts use aerospace quality T304 stainless metric-sized tubing for maximum flow. Low restriction mufflers and resonators are carefully designed to reduce weight. Mandrel bends, TIG welds, and precise fit flanges and mounting hangers are standard on every Neuspeed system.